Since the University of Maryland School of Medicine’s inception in 1807, our faculty have made numerous advances that have dramatically and measurably impacted and improved lives. Our research has not just been theoretical science, but has always had a patient-centered focus. Every day, our faculty are conducting groundbreaking research, asking “big science” questions, and making discoveries leading to new treatments and cures. Our physician scientists truly embody the school’s guiding principle of discovery-based medicine. We’re a leader in a variety of research areas, including chronic diseases, stem cell and composite tissue transplantation, genomics, cancer, HIV/AIDS, heart disease, kidney disease, regenerative medicine, shock trauma and anesthesiology, biomedical engineering and technology, brain science, and global health. 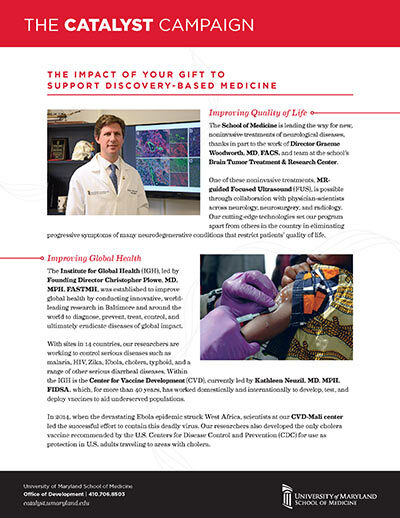 With substantial gifts from generous donors like you, we’ve created new centers and institutes of excellence and interdisciplinary research collaboration where the greatest minds in medicine are making discoveries that lead to new treatments and cures. 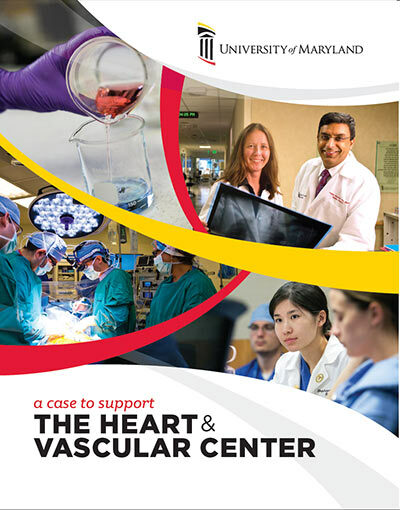 Through the pillars of superb clinical care, research and innovation, and education of the next generation of clinicians and investigators, the University of Maryland’s Heart & Vascular Center provides an environment that is having a major positive impact on those afflicted with heart disease.